Recently our family began a new tradition in our homeschool. Really, it is about homeschooling and training and family and our weekly rhythm. Those are the good things, right? I heard about something similar some time ago in some far away blog post or article and it resonated with me. So I do what any good homeschooler would do: I grabbed onto it and turned it into my own creation, best suited to the needs of our family. What is this special tradition? It’s Home Blessing Day. What is Home Blessing Day? Every Saturday, our family puts away the formal lessons and plans a day at home. My husband works most Saturdays, so it is like our Friday. Instead of pulling out math and writing, we work on sprucing up the house, learning some new homemaking skill, or practicing a handicraft. We focus on making meals together, and I use the day as a focused day of training my children in chores, character, and any other life skill that seems like a good idea. We have come to LOVE this day each week. Home Blessing Day allows us to catch up on household tasks and sets aside time for training opportunities we might have let slip otherwise. Things like teaching a daughter how to clean the bathroom, a son how to turn soil with a shovel, or making a beautiful mess of the kitchen to make some funny snack. Home Blessing Day is a great tool for the busy homeschooling mom. No other activities or responsibilities fill our plates, so we can take the time to focus on our learning and enjoy it instead of rushing or stressing about it. Any wayward homemaking task from the week can land on Saturday and actually has a chance of getting done! Even more importantly, I am taking the time to pour into my kids on things that matter just as much as academics, if not more so. In our home, a typical Home Blessing Day might look like the following. The kids pick out a special snack from the kids’ cookbook I checked out from the library. 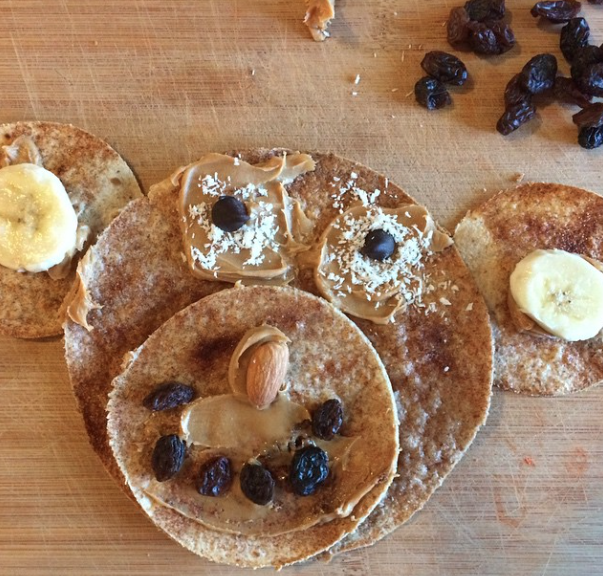 Silly Monkey Snacks! We talk about all the things we need to get ready and when we’ll make the snack. Later in the day everything goes on hold and all we do is make this snack. The kids serve each other and go about the tasks of setting up and cleaning up afterward. I take it as an opportunity to teach them how to use a napkin well and politely (because seriously kids, the napkin doesn’t go in your nose, ok?). I have to get the garden weeded and turned, so they all help me pull weeds (we have a refresher chat on a dandelion unit we did a while back). 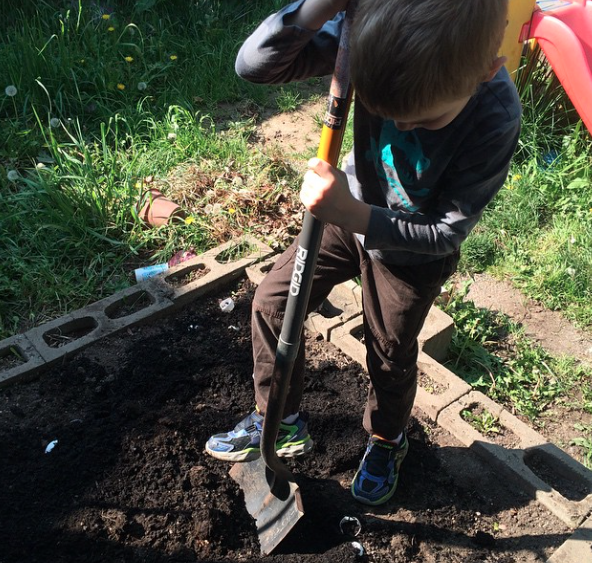 Later I teach my son how to use a full shovel to turn the garden soil and we work in some compost. Then he helps me wrap chicken wire around it in a (vain) attempt at keeping the toddler out. I’m behind on laundry so I work on that while the kids play and I teach my 5 month old the art of folding socks. He is uninterested. The bedrooms upstairs are a disaster, so we all go up there an hour before bed time and rock out while we clean as much as possible with the hopes of leaving it better off than when we started. It is rather successful and we start to get ready for bed. As you can see, it’s not complicated. However it IS intentional. I have lists of ideas for things we can do on Home Blessing Day, and I’ll be sharing those with you over the next few weeks! In the meantime, I’ve put together a simple Home Blessing Day planner for your use. I hope you find it helpful! Thank you Tauna, what a great idea to call it a “Home Blessing” instead of a “family work day”! I love this idea! 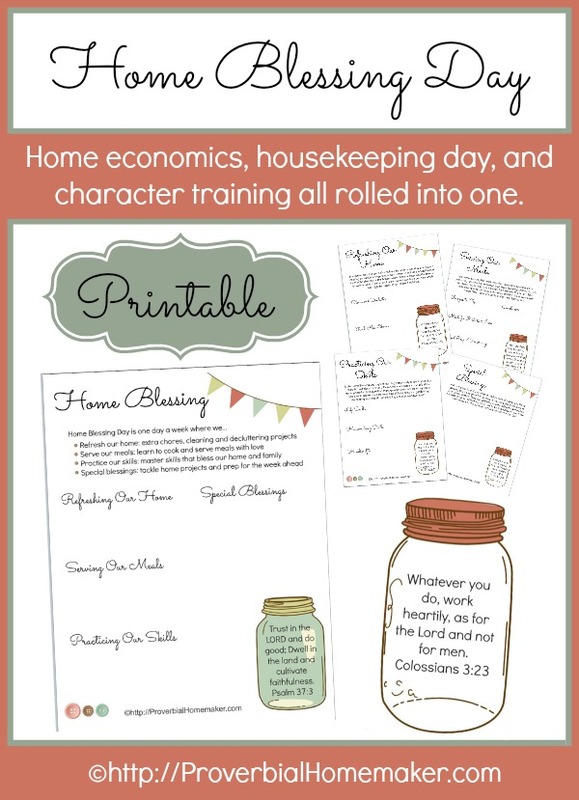 We catch up on cleaning on Saturdays too, but I think these printables along with calling it “home blessings day” would help my kids attitudes tremendously! 🙂 Thanks for creating this resource! Thank you so much for making these free printable. I wanted to stop by and let you know that we have now made Mondays our Home Blessing Day! My whole attitude for the day is wonderful as we only focus on blessing our home with food prep, cleaning and activities that truly bless our home and in returns blesses the red of our week. As a homeschooling mom, I can say that I am excited. We are working on our new weekly rhythm as well. I will be sharing this in my new blog post. Have a wonderful week! 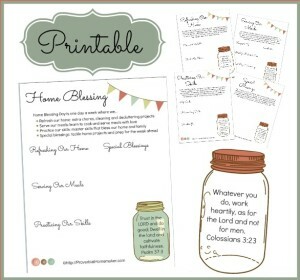 I love the idea and heart behind your “Home Blessing Day”. I am wondering what your other days, throughout the week, look like, in regards to housework/chores/etc. Do you all have cleaning routines for those days, as well, or save it all for your special “blessing” day? Sorry for the delayed response. 🙂 The kids each have a set of chores they do every day. Although which chore they do may vary depending on the time of day, they keep at the same set until they’ve “mastered” it and then I assign them a new one. For example, my 8 year old unloads the dishwasher after breakfast and wipes the table and sweeps the floor after lunch. The other kids have similarly assigned chores. Then once they’re really good at those, we switch things up and add new ones. We’re about ready for that now, actually. We basically “anchor” our chores to certain times of the day and things we always do (like eat). Then the “extra” things get tackled on home blessing day. Hope that helps! Thank God for all of these resources you’ve created Tauna! I have a plan for our Saturdays now. Thanks for a wonderful idea on when to teach some household chores and give more focus on character building on a special day, a Home Blessing Day! More power! God bless! I’m so glad it was a blessing to you! Thank you so much for sharing such a wonderful idea. I LOVE this idea and I can’t wait to get started! All these homemaking posts has made such a difference in our home. I so appreciate you very much Tauna for the encouragement you provide us mamas. I love that everything you create helps us be more intentional in our homemaking. The planner won’t print for me. When I tap the image, all it will let me do is save it to Pinterest. Can you help? Hello! There is a from toward the bottom of the post to enter your name and email address. We’ll send you the download link!